Pregnancy continues to interfere with my food blogging. But now it’s meddling in a new and more creative way than morning sickness that’s not bad enough to complain about but was annoying enough to keep me from cooking anything interesting enough to write about. No, now it’s gotten sneakier. A couple of weeks ago, I decided to have dinner waiting for Chris when he got home, in an attempt to make up for all the times he made dinner this spring when I wasn’t feeling up to it. I had a cucumber and several tomatoes–beautiful tomatoes, small Camparis as red as fire engines and hovering just at the apex of perfect, sweet ripeness–so something vaguely Greek/Mediterranean seemed the way to go. I turned to a box of falafel mix in the cupboard, but suddenly plain falafel fried up from a mix seemed too boring for those tomatoes. 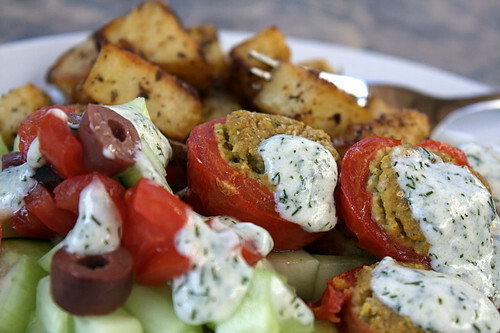 This entry was posted in Cooking and tagged falafel, tomatoes on June 23, 2009 by Jessica Petersen.